will have an immediate and positive impact on your financial future while reducing your staffs’ workload. At MRC we have a strong desire to help those within the autism community. We provide specialized services to ensure that your practice thrives. Whether you are just starting your practice or have been practicing for years, navigating through the complexities of the insurance world can be challenging. You can grow your practice and attract more families when you are in an insurance company’s network. Our enrollment experts can help! Medical Reimbursement Consultants specializes in ABA and Physician medical billing and practice support for autism centers and healthcare providers. Including physicians, psychiatrists, psychologist, BCBA, PT, OT and SP. MRC services, procedures and software help busy practices keep up. Telehealth and remote patient visits are becoming a bigger piece of the puzzle as we seek out new ways to drive down healthcare costs. Patients are demanding more flexible, convenient access to their providers in both suburban and rural environments. Make sure your practice is ready to respond. 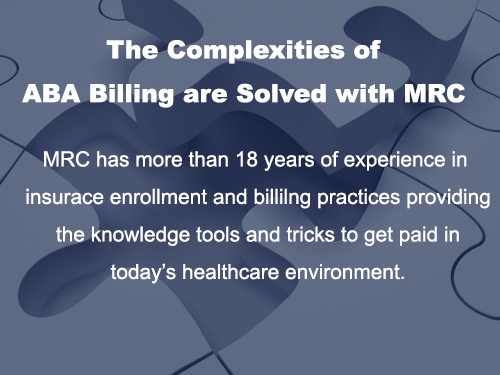 Contact MRC to see how we can help your practice grow. Established in 1995, we are a dedicated medical insurance billing, ABA Therapy Billing Service, and practice consulting service. We utilize state of the art equipment and software that focuses on ABA practices. MRC can help you develop and implement a successful revenue management process.